I love truffles/ball shaped desserts apparently. 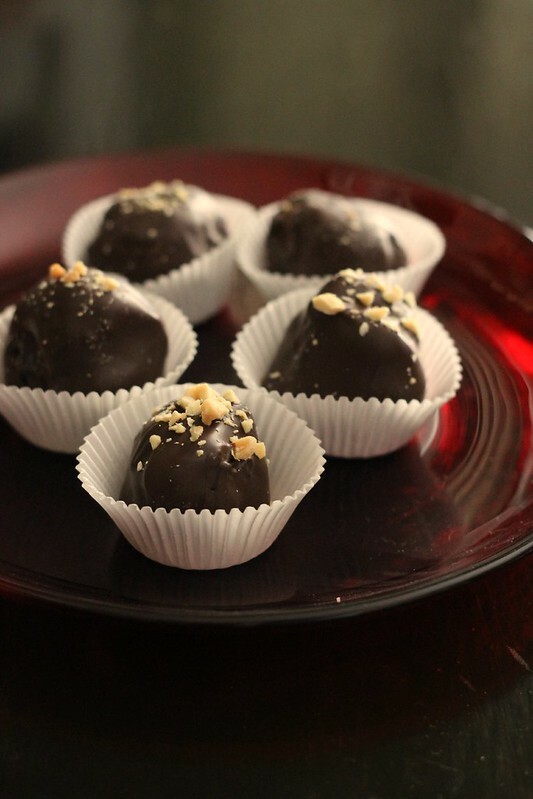 There's these Peanut Butter Pretzel truffles I shared last year. Cookie Dough Truffles And, of course classic Oreo Truffles (which sadly I now see I didn't even post a picture of them! ), but combine a few of those, and you get this adorable little baby - Peanut Butter Oreo Truffles! Now, I admit that one night while we had a babysitter, Rob and I drank a bit of wine and started snacking. Our standard late night snacks are nachos, PB and crackers (his) and cheese and crackers (mine). This particular night we had Oreos as well. Rob decided to spread a little PB on the Oreo and I'm certain I looked at him like he was ca-razy! Not that it sounded bad, but just WHY?! Well, I'll tell you why. Because it was fantastic! And yes, I realize there are PB Oreos out there - but I've had them and I'm not a fan. And yes, I could try to make my own, but I haven't really felt the need since I prefer a classic Oreo cookie! But enter my love of Oreo Truffles. What would happen if I essentially replaced the Cream Cheese with Peanut Butter?! So, finding the perfect reason, I decided to try this out. With just a few ingredients and a little time to allow them to chill, these are well worth it. *Note - I should point out that I used Chunky peanut butter, as that's our family preference. Plus, we used creamy on our Oreos on a family trip one night and it just wasn't the same. So, I totally recommend Chunky, but use whatever floats your boat! In a food processor, finely crush the cookies. In a large bowl, mix the cookies with the peanut butter and cream cheese until well blended. Line a baking sheet with parchment or wax paper. Shape the cookie mixture in to 1 - 1 1/4" balls, placing on lined baking sheet. Freeze for 15-30 minutes. When ready to coat with chocolate, heat a few inches of water to a simmer in a medium sauce pan. Place chocolate chips in a large glass bowl, set on top of the simmering water. (Make sure that the water is not touching the bottom of the bowl). Stir the melting chocolate until mostly melted. Add shortening and continue stirring. Place prepared balls in melted chocolate, stirring around with a fork or two to completely cover the ball. Place on a prepared baking sheet and sprinkle with peanuts if desired. Continue coating all pieces and refrigerate when finished for an hour, or until firm. These can be made in advance, just move to an airtight storage container.